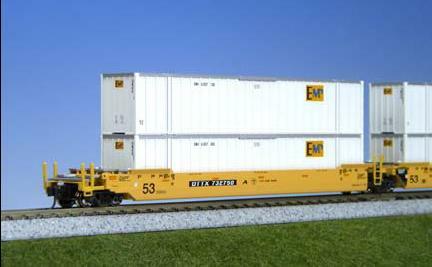 Dear N Scale Customers: We have a Special Offer on Kato Gunderson TTX Maxi Stack IV's for the Holidays. All TTX Maxi Stack IV's are Sale Priced at $49.95 each! The Special Price is in effect until Jan 6th 2007 (or earlier until supply runs out). We have a limited number of sets so we will honor orders ona first come basis. Intermodal Container service is one of the most popular types of freight service on the rails today. The Maxi-IV car is the mainstay of the U.S. domestic double-stack car fleet. TTX took delivery of their first MAXI-IV's in 2000. Ongoing deliveries of this car have put the total in service on the TTX roster in the thousands. They can be seen on virtually any mainline railroad from coast to coast. The Maxi-IV design provies the optimum balance between tare weight and capacity and have proven to be extremely reliable in service. The Gunderson MAXI-IV is a 3-unit articulated double-stack car than can handle containers from 20' to 53' long in the well and from 40' to 57' in the top, or double-stacked position. As a result of its versatility and sturdy construction, the MAXI-IV is now the mainstay of the US double stack fleet. This will be the first time the MAXI-IV has been made in N Scale! Ttraction coupled with extensive piping detail added. Like the prototype, the model will feature 2 different sized wheels: the end trucks will have 33" scale wheels while the middle trucks will have 38" scale wheels. Shock absorber construction will provide smooth operation. The KATO Kinematic trucks will maintain prototypical appearance on straight track and provide smooth operation through curved sections. Cars will feature magnetic knuckle couplers. 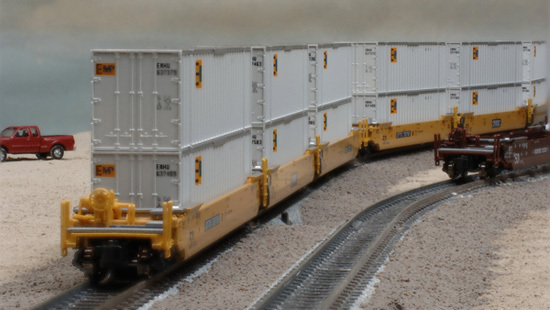 Each set will include 6 EMP indivually numbered 53' containers. Packaging designed for the separated storage of the articulated unit providing ease and security when not in use.